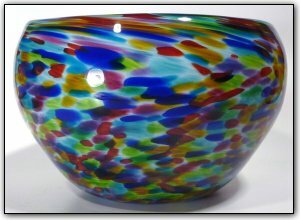 This bowl is from the End Of Day® series, meaning it is made with a variety of colors used throughout the day, and contains nearly every color in the rainbow on the exterior. The interior is bright and vivid featuring many shades of luscious blues. This big and heavy bowl measures over a foot wide and sits at a slight angle to highlight the interior.